Thank you to Andrew Bailey for this research. Charles was Henry & Ellen’s third child and only son. His older sisters were Annie (born Wotton 1890) and Winifred Ada (born Wotton 1894). The 1911 Census notes that Ada was an assistant dress maker working with her mother, describes Winifred as being ‘feeble minded from birth’ and notes that Charles is a schoolboy. Charles enlisted at Stoughton Barracks in Guildford, having been called up for service on reaching 18 years old. It appears that he initially served as Private 49470, Bedfordshire Regiment (possibly for his period of training) before being transferred to 9th (Service) Battalion Essex Regiment, becoming Private 49514. The 9th Essex had arrived in France at the end of May 1915, and Charles would have joined the battalion in France on completion of his basic training and on reaching the age of 18 and a half, probably in mid 1918. He was posted to the battalion’s ‘C’ Company. At the start of September 1918 the 9th Essex were out of the line training in the Montauban area. At 8pm on the evening of 3rd September 1918 the unit received ordered to prepare to relieve the 10th Bn Essex Regiment (of the 18th Division) who were holding the front line to the east of the Canal du Nord. At 7pm the 9th Essex moved off towards the firing line, arriving at 10.30pm. As they were in the process of relieving the 10th Essex orders were received that the battalion was to attack the following morning. At 11.30pm the Commanding Officer held a conference for all of the officers in the ‘C’ Company Head Quarters. The battalion was ordered to attack at the designated zero hour (6.45am) and take the enemy trenches at an area equidistant between Marancourt and Nurlu. ‘C’ Company was to take the first objective, following which ‘A’ and ‘D’ Companies were to pass through ‘C’ and take the final objective. In darkness at 2 am on 5th September 1918, Charles and the men of ‘C’ Company, 9th Essex moved off towards their assembly positions to the east of the Canal du Nord, followed by ‘A’ and ‘D’ Companies. At 6.45am, zero hour, the men rose out of there assembly positions and moved towards the enemy front line. ‘C’ Company successfully achieved the initial objective and ‘A’ and ‘D’, moving through ‘C’ Company to continue the advance, were subjected to machine gun fire before they too succeeded in taking their final objective. The battalion then set about holding the captured position. As the morning drew on the trench that ‘C’ Company held was subjected to enfiladed machine gun fire from the high ground to the north and sustained heavy casualties. At 11am a bombing attack was mounted against them but repulsed. ‘A’ and ‘D’ Companies, holding the forward position, were heavily shelled until 1pm. As night fell the line quietened, and passed with only a degree of gas shelling of the forward area. 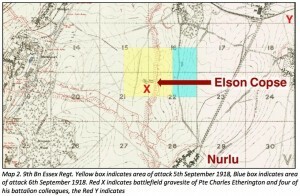 At 3.15am on the morning of 6th September, orders were received to attack the high ground north of the village of Nurlu in conjunction with 21st Division, advancing on the battalion’s left. Zero hour was set at 8am, when ‘C’ ‘D’ and ‘A’ Companies attacked the trenches in V.16.d and V.22.b. As the men advanced they had to pass through two belts of barbed wire each about 30 yards thick. In this process, the battalion suffered fairly heavy casualties as a result of determined resistance by the enemy. The objectives were taken and patrols were pushed forwards to locate the enemy on the high ground west of the village of Heudicourt. The night of 6th September passed quietly and the advance was continued the following day by the men on 37th Brigade, who passed through the battalions positions. On 8th September, the 9th Essex was brought out of the front line. It is unclear whether Private Charles Henry Etherington was killed in action on the 5th or the 6th of September. His body was initially buried in a single battlefield grave with 4 other men from the battalion, a point 100m south of the southernmost point of Elsom Copse. The men’s grave was marked with a single cross giving their date of death as the 5th. The location of their grave indicates that the five men were killed (possibly together) in the area over which the battalion was attacking on the 5th. All other records give the date of death of the five men as the 6th. It is possible that the battalion returned all of the casualties for the two days of action as having occurred on the 6th. The battlefield grave south of Elson Copse was in a very isolated position, and after the war the decision was taken to move many of these isolated graves to locations that permitted ease of maintenance. Charles and his colleagues were reburied in Fins New British Cemetery in November 1920. On 9th September 1919 Ellen Etherington (of Oakwood Hill) applied for Charles’s medals. He was awarded the British War Medal and the Victory Medal, and is commemorated on the Okewood Hill War memorial and the Forest Green War Memorial (part of the same parish). Sadly, it appears that his Personal Service Record was destroyed by enemy action during the Second World War.